The rasping call of the corncrake was a familiar night-time sound throughout the Irish countryside only a generation ago. Despite its former abundance, its secretive behaviour meant that it was rarely seen, except when grass was being mown in the summer. Now the corncrake is virtually extinct in Northern Ireland and restricted to a few stronghold areas in the Republic of Ireland. The dramatic decline of this species has been recorded across western Europe, and is inextricably linked to changes in agricultural practices which occurred during the twentieth century. The Corncrake has undergone a catastrophic decline throughout its range due to major agricultural change, most notably the switch from hay to early cut silage. The corncrake is a member of the rail family, although unlike most other rails, it prefers drier habitats. This has given rise to an alternative name of ‘Land Rail’. 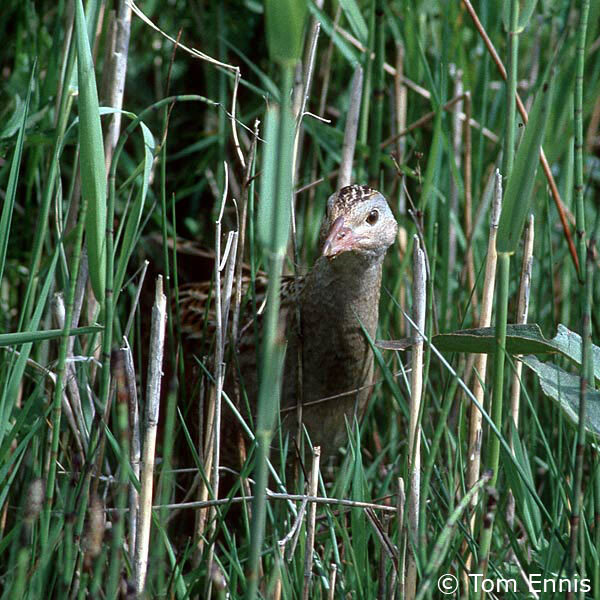 The corncrake is highly secretive and is rarely seen in the open, concealing itself effectively in long grass and herbaceous vegetation. When they do break cover, the birds appear quite slender, with a longish grey neck, grey breast, strongly barred flanks, short stubby bill and long legs. If seen in flight, which is generally a short fluttering affair, the rich chestnut wing panels and dangling legs are distinctive. The corncrake’s rasping, double-call ("crex crex") can carry for long distances on a still night, and can be given all night long when the bird is seeking a mate. 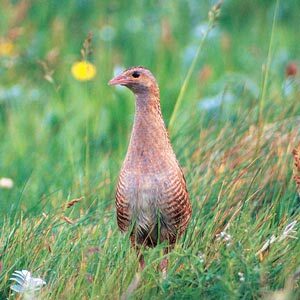 The corncrake arrives at its breeding grounds in Britain and Ireland from mid-April onwards. Eight to twelve eggs are laid in a simple, well-concealed nest on the ground. On hatching, the all-black chicks are able to feed themselves after several days and are independent within a few weeks. 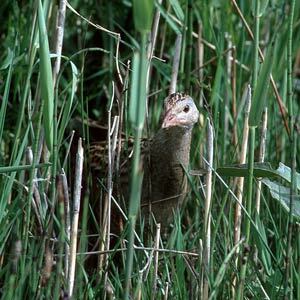 Corncrakes are double-brooded, and the first is usually hatched in early June, the second by late July. The young birds do not fledge for five weeks, and young can still be present close to the breeding site in early September. Mowing of grass meadows before this time can therefore have a significant impact on the number of young corncrakes reared. Most birds have left for Africa by mid- to late September, but there are some intriguing old records of wintering birds. Along with the bird’s apparently weak powers of flight, this may have given rise to the folklore that corncrakes hibernate over the winter months. Rarely seen, but young game birds (especially pheasant) can be a source of confusion, the chestnut wing panels are characteristic of corncrake. Though always difficult to see, the best opportunity is to visit Tory Island, County Donegal when the birds first arrive; in mid-April the turf is short and birds find hiding difficult! 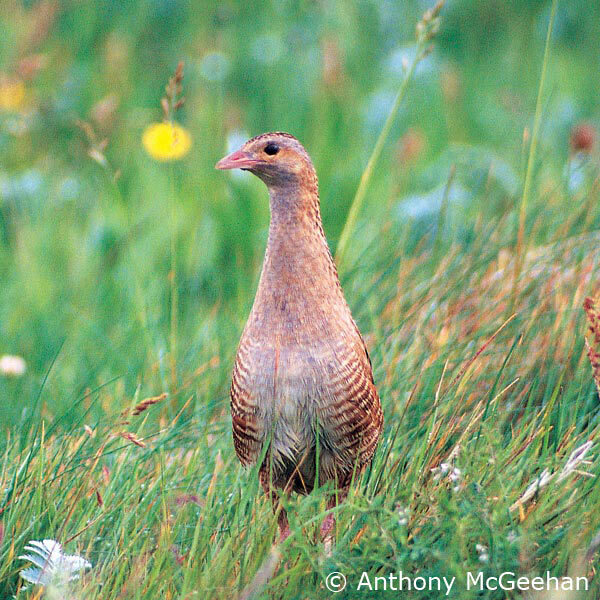 In Ireland the corncrake survives on in key areas such as North Donegal, the Shannon Callows and west Mayo. Extinct as a regular breeding bird in Northern Ireland. A few birds still turn up most years in Northern Ireland, in places such as Rathlin Island, County Antrim. 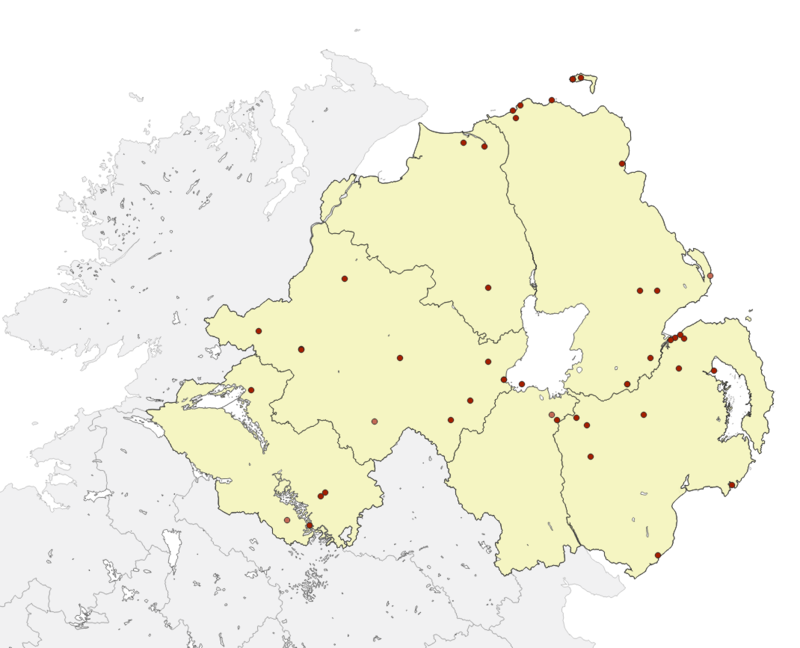 In Northern Ireland the species is extinct as a regular breeding bird. As a ground-nesting bird the corncrake is especially vulnerable to mammalian predators, such as rats, mink, stoats and cats. In Great Britain and Ireland, the corncrake is associated with grass meadows and other areas of dense cover, such as nettle patches. Traditionally flower-rich hay meadows would have been favoured, and still are in the corncrake's remaining strongholds. More recently, corncrakes have used more intensively managed grassland, destined for cutting as silage, and which unfortunately is often cut too early in the season to allow the birds to breed successfully. The sympathetic management of grassland is critical for the corncrake's long-term survival as a breeding bird in Ireland. Ideally, on first arrival they require vegetation which is long enough for them to secrete themselves until the surrounding meadows have grown to a suitable height. The meadows in which they nest must have a loose sward structure through which the birds can easily move, so rank unmanaged grassland is not suitable for them. They then require the meadow to remain uncut, until at least mid-August, when the later brood of chicks is able to fend for itself. The trapping of migrating game birds in North Africa and the Middle East has been investigated as a potential cause of corncrake decline. However, although some corncrakes are certainly caught in this way, the numbers are relatively low and this has been discounted as a significant factor in their decline. The Countryside Management Scheme contains measures for species-rich grassland, and while this is not specifically aimed at corncrakes, the measures should benefit wildlife in general. By 2015, re-establish breeding populations in other parts of its former range, in suitable areas in both Northern Ireland and the Republic of Ireland. If you are a landowner, and have areas of species-rich meadow, contact DARD to find out about applying to join an agri-environment scheme. A simple identification web page provided by RSPB; it includes audio and video links. Some excellent photographs of corncrake, taken on Tory Island, County Donegal by Paul and Andrea Kelly. Copland, A. and Donaghy, A. (2001). A Strategy for Corncrake Conservation in Ireland 2001-2010. Unpublished Report, BWI Dublin 2001. Green, R.E. and Williams, G. (1994). The ecology of the corncrake Crex crex and action for its conservation in Britain and Ireland. In: Bignal, E. and Curtis, D.J. (Eds) Nature Conservation and Pastoralism in Europe, Proceedings of the third European Forum, JNCC, Peterborough: 69-74. Green, R.E. and Rayment, M.D. (1996). Geographical variation in the abundance of the Corncrake Crex crex in Europe in relation to the intensity of agriculture. Bird Conservation International 6: 201-211. Holloway, S. (1996). The Historical Atlas of Breeding Birds in the UK and Ireland. T. & A.D. Poyser, 1996. Ruttledge, Major R.F. (1966). Ireland’s Birds. Witherby, London. Schäffer, N. and Green, R.E. (2001). The Global Status of the Corncrake. RSPB Conservation Review 13: 18-24. RSPB, Sandy, Beds. Tyler, G.A. (1996). The Ecology of the Corncrake with special reference to the effect of mowing on breeding production. Unpublished PhD thesis, NUI Cork. Whilde, T. (1993). The Irish Red Data Book. Vol 2: Vertebrates. HMSO, Belfast. Allen & Mellon Environmental Ltd.